Just five days before Earth Day, a Porter Airlines flight from Toronto to Ottawa on Tuesday has become the first biofuel-powered passenger flight in Canada. But if you think because biofuel can now be used on commercial flights, the price of flying may come down, think again - at least for the foreseeable future. Biofuel is about seven to 10 times more expensive than standard jet fuel, but Porter hopes it will be an option in the future. "What we hope to accomplish by doing this is raise awareness, make (biofuel more commercially viable in the future so that hopefully one day it can be at a production and price point that's more widely available and affordable," said Porter spokesman Brad Cicero in an Ottawa Citizen article. While the cost is much higher, the biofuel used in a recent Qantas airlines flight has a carbon footprint that's 60 per cent smaller than jet fuel. The plane was not fueled entirely by biofuel, but one of the Bombardier Q400's turboprops was run on a 50/50 mix of standard jet fuel and more eco-friendly biofuel. The mixture is 49 per cent camelina sativa and one per cent brassica carinata. The oilseed crops are produced by Saskatchewan-based Targeted Growth. "The use of biofuels promises to significantly reduce the level of emissions produced by commercial aircraft worldwide," said President and CEO of Porter Airlines Robert Deluce in a statement. He said his company is delighted to complete such a flight less than a week before Earth Day. 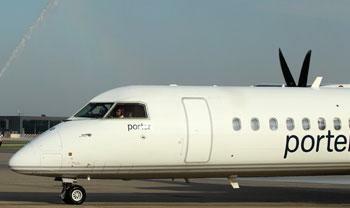 The flight was the final step in a two-year project that saw Porter working with Pratt and Whitney Canada, the company that manufactures the engines for the Q400. Honeywell UOP Provided the Honeywell Green Jet Fuel for the flight. "We have implemented new technologies to significantly reduce fuel consumption, environmental emissions and engine noise in our latest generation of engines and we are developing cutting-edge green technologies for the future, to help the aerospace industry reach its commitment of reducing its overall footprint," said Pratt & Whitney Canada Vice President Daniel Breitman in a statement. Porter's flight follows Qantas Airlines launching Australia's first commercial flight Friday using a 50/50 mixture of refined cooking oil and regular fuel. Qantas has added incentive to reduce fuel consumption as Europe and New Zealand impose carbon taxes on airlines. "We need to get ready for a future that is not based on traditional jet fuel or frankly we don't have a future," said Qantas chief executive Alan Joyce in an Ottawa Citizen article. "And it's not just the price of oil that's the issue - it's also the price of carbon."